SINGAPORE - To keep Singapore's services sector competitive, companies in the sector will have to rely even less on foreign workers and become even more productive. 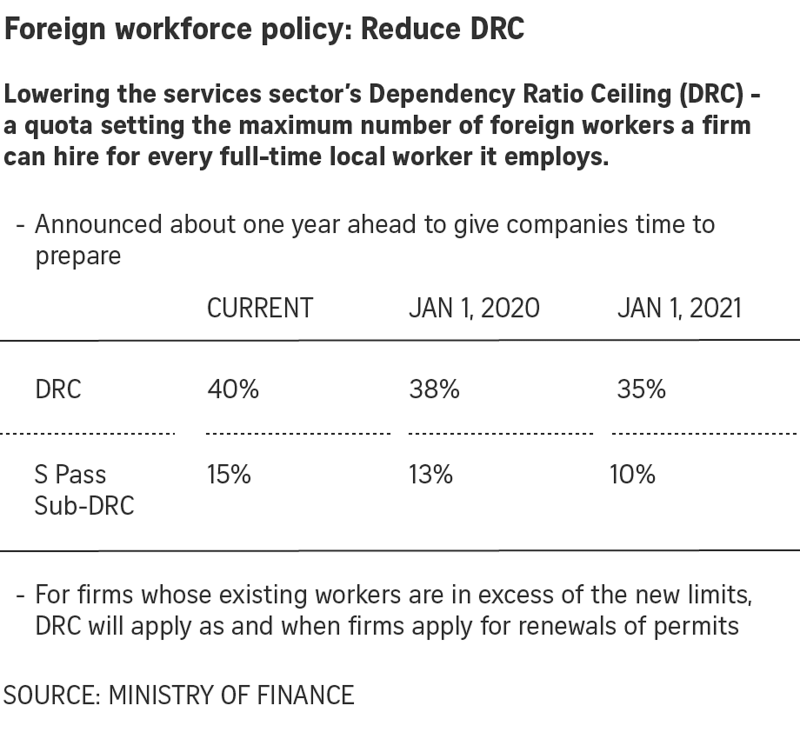 The Government is tightening the Dependency Ratio Ceiling (DRC), or the proportion of foreign workers a firm can employ, from 40 per cent to 38 per cent on Jan 1 next year, and to 35 per cent on Jan 1, 2021. For the subset of S Pass workers - mid-skilled foreigners earning at least $2,300 a month - the quota will be cut from 15 per cent to 13 per cent on Jan 1 next year, and to 10 per cent on Jan 1, 2021. The last reduction was in 2013. For firms that exceed the new ceiling, the new quota will apply when they apply for renewals of permits. Finance Minister Heng Swee Keat said during the Budget speech on Monday (Feb 18) that the decision to reduce the quota was done "after much deliberation". Although some firms have done well to deploy their staff efficiently, such as those in the manufacturing sector, some segments in services such as retail and food and beverage remain very labour-intensive, he said. Growth in the number of S Pass and work permit holders in services has been picking up pace, rising by about 3 per cent per year or 34,000 in the last three years. In particular, the S Pass growth in services last year was the highest in five years. This trend may be unsustainable, said Mr Heng. "We need to act decisively to manage the manpower growth in services, and encourage our companies to revamp work processes, redesign jobs and reskill our workers," he said. What is needed is a sustainable inflow of foreign workers to complement the workforce here, while Singaporean workers are upgraded and enterprises build deep capabilities, he said. To help firms as they adjust to the changes, higher funding of up to 70 per cent under two grants will be extended for three years up to March 31, 2023. The Enterprise Development Grant (EDG) funds projects for firms to improve efficiency and internationalise, while the Productivity Solutions Grant (PSG) subsidises the cost of off-the-shelf technology to help firms boost productivity. Both grants were announced at last year’s Budget and the funding cap of 70 per cent was due to drop to 50 per cent after March 31 next year for the EDG and for certain sectors under the PSG. The schemes will be reviewed again closer to the new end date. To enjoy the extended higher funding support under the EDG, companies will need to commit to outcomes for workers, such as wage increases, from April 1, 2020. Meanwhile, under the PSG, firms will be able to apply for a training subsidy of up to 70 per cent of out-of-pocket training expenses, capped at $10,000 per enterprise. They must submit a training plan for assessment. More details on the changes will be given at later date. The Manpower Ministry still provides some flexibility for companies to employ more foreign workers while they transition to a more manpower-lean operating model under the Lean Enterprise Development Scheme, as well as on a case-by-case basis if companies need to bring in foreign workers with specialised skills lacking among Singaporeans. Meanwhile, there will be no changes to the foreign worker levy rates this year. The previously announced increase in levy rates for the marine shipyard and process sectors will be deferred for another year, as the sectors have only begun showing early signs of recovery, said Mr Heng. Mr Heng also said the Government is focusing on deepening the capabilities of workers as the economy transforms. "Our ultimate goal is to enable our people to continue to have good jobs and opportunities, and to be at their best," he said. In the 2017 Financial Year, the Government spent more than $1.1 billion on supporting people in their careers, through initiatives such as Adapt and Grow and continuing education and training. From 2016 to 2018, more than 76,000 jobseekers found work through Adapt and Grow programmes. Also, more people are participating in training, with the participation rate growing from 35 per cent in 2015 to 48 per cent in 2018 among Singaporeans and permanent residents in the labour force. Workers, firms, unions and trade associations and chambers all need to play a part to continue this progress, said Mr Heng. To help experienced workers, the Career Support Programme, which is due to end next month, will be extended for two years. It subsidises the wages of Singaporeans who are mature and retrenched or are long-term unemployed, who are hired for professional, manager, executive and technician (PMET) jobs. New professional conversion programmes relating to blockchain, embedded software and prefabrication will also be launched to help workers move into careers in growth areas. Over the next three years, $3.6 billion has been set aside under the jobs and skills budget for the Manpower and Education Ministries to help workers thrive amid industry and technological disruptions. Highly skilled workers make companies stronger, while stronger companies provide better jobs and pay for workers, said Mr Heng.